Play Misty for Me. 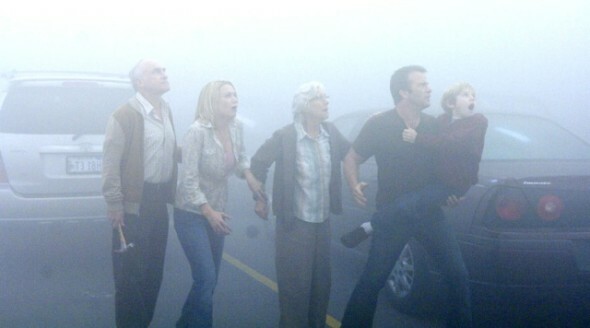 Spike TV has ordered The Mist TV series, based on the Stephen King novella of the same name. For the first season the network has ordered 10 one-hour episodes. Production begins this summer, with an eye toward a 2017 premiere. Spike ordered The Mist TV show pilot in February, but the series pitch and script were so strong, the network decided to go straight to series. Christian Torpe is executive producing The Mist. Megan Spanjian oversees the project for TWC-Dimension TV with Matthew Signer, and Keith Levine. Sharon Levy, Ted Gold, and Lauren Ruggiero, oversee The Mist for Spike. New York, NY, April 14, 2016 – Spike has greenlit a new original scripted series, “The Mist” from TWC-Dimension Television (TV) based on the classic Stephen King novella. The network has ordered 10 one-hour episodes and will into go production this summer and debut in 2017. The announcement was made today by Sharon Levy, Executive Vice President, Original Series, Spike TV. “The Mist” tells a harrowing story about a seemingly innocuous mist that seeps into a small town and creates immense havoc. “From the brilliant mind of Stephen King and the incredible production team at TWC-Dimension TV, ‘The Mist’ will take audiences on a thrilling ride through a small town grappling with a mysterious and shocking horror,” said Levy. “Christian and the entire team at TWC-Dimension TV have crafted the framework for a compelling and distinctive series that will resonate with Spike’s expanding audience,” said Levy. Christian Torpe serves as the Executive Producer for Spike’s “The Mist.” Torpe created the successful show RITA in Denmark, now finishing its fourth season, and has developed programming for both Showtime and AMC. Megan Spanjian, EVP of Scripted TV, was instrumental in finding and bringing Torpe to the table and will oversee the project for TWC-Dimension TV along with Matthew Signer, EVP of Production and Creative Affairs, and Keith Levine, SVP of Production and Development. Torpe is repped by ICM and Artists in Residence. Levy, Ted Gold, Senior Vice President, Scripted Original Series, and Lauren Ruggiero, Senior Director, Scripted Programming will oversee the project. TWC-Dimension Television debuted its first scripted series SCREAM, which is an adaptation of the hit horror film franchise, with MTV. With a successful first season SCREAM TV was picked up for Season 2, which is currently in production and will debut on May 30, 2016. Spike TV is available in 91.4 million homes and is a division of Viacom Media Networks. A unit of Viacom (NASDAQ: VIA, VIAB), Viacom Media Networks is one of the world’s leading creators of programming and content across all media platforms. Spike TV’s Internet address is www.spike.com . What do you think? Have you read the Stephen King story? Do you plan to check out The Mist TV show, when it premieres on Spike? More about: Spike TV TV shows: canceled or renewed?, The Mist, The Mist: canceled or renewed? Please renewed for another season many more seasons to come I can’t wait to see it looks good.